Reproductive health care access has been under attack, both nationally and statewide, but Planned Parenthood Advocates of Arizona has endorsed candidates who have shown strong commitment to reproductive justice. The Tempe general election will be held on March 13, 2018, with ballots mailed to registered voters on February 14. Make your voice heard in 2018! In the upcoming Tempe special election, there are six candidates vying for three open City Council seats. Tempe residents will also cast their votes for three separate ballot initiatives. For the first time in the city’s history, all registered voters will receive their ballots by mail. Planned Parenthood Advocates of Arizona (PPAA) has endorsed two Tempe City Council candidates: Genevieve Vega and Lauren Kuby. As a small business owner and consultant, Genevieve Vega has spent her adult life serving the city of Tempe. In addition to working as a professional business consultant, Ms. Vega serves on the Tempe Community Council and the Phoenix Suns Charities 88 Board of Directors. She is “unapologetically pro-choice,” and she is proud to have received endorsements from both PPAA and Arizona List. 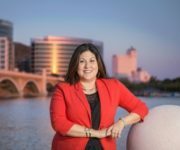 Ms. Vega has also been endorsed by Tempe Mayor Mark Mitchell; current council members Lauren Kuby, David Schapira, and Randy Keating; and a host of other community leaders. If elected, Ms. Vega will be the first Asian-American council member to represent Tempe. On February 11, 2018, Ms. Vega took the time to be interviewed by PPAA, offering insight into her background and the motivations behind her candidacy. Service is core to who I am. I wouldn’t be here if it wasn’t for a Green Beret, who in the Vietnam War rescued a wounded and orphaned Vietnamese girl. He decided to adopt that girl, the first Vietnamese adopted in the U.S., who graduated from ASU. She’s my mom, and raised me as a single mom until I was 9. She and my stepdad live in Tempe today. My husband Dave and I chose Tempe as the place to raise our family — we have a special-needs second grader and a freshman in public schools. I’m a two-time Sun Devil with an executive MBA and I run my own consulting business helping businesses with training and development for growth. What motivated you to run for Tempe City Council? After over a decade of community service, I never expected to run. But fighting a nearly two-year battle trying to get the right education and services for my special-needs daughter, I realized how many families were like mine — struggling to manage, faced with quitting a job or reducing hours because there is little support for working families raising a special-needs child. And these differently abled kids needed someone who would fight for their inclusion and acceptance. Knowing politics, campaigns, and elections, I knew I could be a strong advocate for families like mine. Health care decisions are between a patient and their doctor. Period. No legislator should be making personal decisions based on religious dogma or an entitled sense of knowing what’s best for people they can’t possibly relate to. What can Tempe do as a city to contribute to the health and wealth of Arizona overall? Tempe leads by example in many areas. From being the most generous city in Maricopa County for human services with financial stability initiatives to keep Tempe families out of crisis, to our free pre-K program for working families, to our equal pay program to empower women to negotiate salaries and helping businesses earn this designation, to our free local bus and bike-friendly infrastructure. Collaboration between municipalities, school districts, and the Legislature on best practices in a nonpartisan approach could go a very long way to benefit more of Arizona. What is your vision for Tempe? An inclusive city with a robust economy working in harmony with ASU and the neighborhoods. Character areas known for their art installations, parks, and strong neighborhood groups. Schools that have what they need with help from parents and community members, with safe routes to and from school, and diverse, inclusive after-school and weekend activities. Communication throughout the city on what’s available, what’s coming, what we need input on, and where we can donate our time and treasure. I am unapologetically pro-access to health care and pro-choice. As an Obama delegate in 2008, I was a Planned Parenthood and NARAL delegate. In 2009, I was an Arizona List intern and I am currently an Arizona List endorsed candidate. I’ve never been anything but pro-choice and I’ve also been a Planned Parenthood patient when I was away and needed my annual check-up and birth control. I never considered going anywhere but Planned Parenthood because I know the services available. Planned Parenthood is such a vital source of health care for our community. Planned Parenthood Advocates of Arizona fights to protect access to this care, and I’m proud to be endorsed! Is there anything else you’d like the voters to know about your campaign? If elected, I’ll be the first Asian American representing Tempe! I was pleased to learn that! I’m also honored to have many endorsements. To learn more about Genevieve Vega, visit her website. You can also follow her on Facebook or Twitter. You can contact us if you’d like to volunteer for an endorsed candidate. This entry was posted in Elections and tagged Arizona List, Arizona State University, Asian Americans, ASU, city council, David Schapira, disabilities, education, equal pay, Genevieve Vega, Lauren Kuby, Maricopa County, Mark Mitchell, Meet Our Candidates 2018, NARAL, public education, Randy Keating, special election, Tempe, Tempe City Council, Vietnam War by Elizabeth Hannah. Bookmark the permalink.